Over here at the Strandberg headquarters, Sunday is turning into play day. Leaving the day job turned weekdays into work days, and as all of you on the waiting list and build schedule know, there is a lot going on. But it’s great to be able to free up a little time for new development! I have been planning a bass since 2012. The design was done, and the prototype hardware was manufactured at that time. However, things do seem to stack up and get in the way. I had 9 pcs of hardware made, and in a weak moment, I sold 5 pcs to the amazing bass builder Alex Watson. At this time, I really wish I hadn’t, because the prospect of making the first .strandberg* bass a 4-string hurts. But it might be a blessing in disguise, because if it doesn’t work, at least I know it’s not because it has too many strings. More information will follow shortly, but for now, I’m facing a lot of design decisions. The prototype will share the same materials as the first Varberg prototype guitar: Macassar Ebony top, Swamp Ash core and Mahogany back, with a Rosewood neck and Ebony fretboard. The pickups I purchased back then are Lace Alumitone Jazz bass and Precision bass pickups. I’m not really keen on changing those overall specs, but will gladly take input now on scale lengths and string spacings, etc. 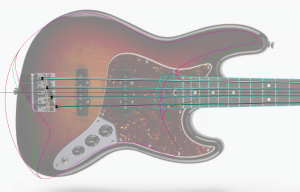 The sketch you see has 33″ – 34.5″ scale length and 19 mm spacing at the bridge, and roughly 9.5 mm at the nut (Jazz bass measurements). Thanks Jonathan, it is definitely getting a compound radius, and EndurNeck™ profile neck. I understand the initial design phase is mostly complete. but if you haven’t already, maybe this is a good opportunity to revisit the neck heel… not that the varberg execution is bad; in fact, it’s excellent. however, if anyone were to come up with a more elegant bolt-on construction method that also feels like a neck-through; it’d be you. if the concept can be proven with the exaggerated stresses on a bass, then it might translate well on guitar. Excellent points – and the design is not finalized at all when it comes to those details. Hallo Ola! I am the bassit that played with Allan Marcus at 2015 NAMM. I have to say it appears to be the next step in the evolution of Strandberg Guitarworks. I scale length iand spacing looks good. I’m not familiar with the pickups but, if you can offer a competitive sound, I’m in! 5 string and 6 string models are a must but, I understand your situation and arrangement. Cheers to you Ola! I wish you the very best! Im a bass player and im in the waiting list, my request its going to be a 7 string bass, low b to high f. So please make a 7 string version of this! I would push for a 5 or even a 6 string. The cantilever effects of a bass neck are more pronounced than guitar. Granted headless helps, but more strings would help you determine if you need to modify the upper horn length to maintain proper balance. You could use the ABM single barrel tuners. Not a bad hardware compromise for a prototype. Would also add that for most manufacturers the % of 4 string sold decreases with higher prices. Just think you’ll get way more interest in 5+ strings. Once owned an original Fender Stu Hamm Urge bass. While I could never get used to the short scale, it had a J-P-J three pickup config, with active/passive switch as well. Resulted in a bass with quite a range of tone. 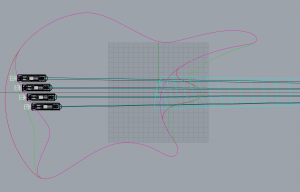 If you’re testing things out, why not try both sets of pickups in the prototype? Thanks Andy. This particular bass is as much about trying out the tuners first hand (I heard from Watson that they worked well) as trying out the other concepts. One important part is the balance of the instrument, and my hardware weighs about 1/2 of the ABM hardware and even less if you include the string lock. See http://guitarworks.thestrandbergs.com/2012/01/08/bass-tuner-specs/ for details. This is going be revolutionary. The only thing I would say is EQ control. Because many player want versatility going from a fat sound for certain style of music to more snappy single coil sounds for others. Either way this is going to be awrsomr and I cant wait. Thanks Daniel, do you have a proposal for a good one? 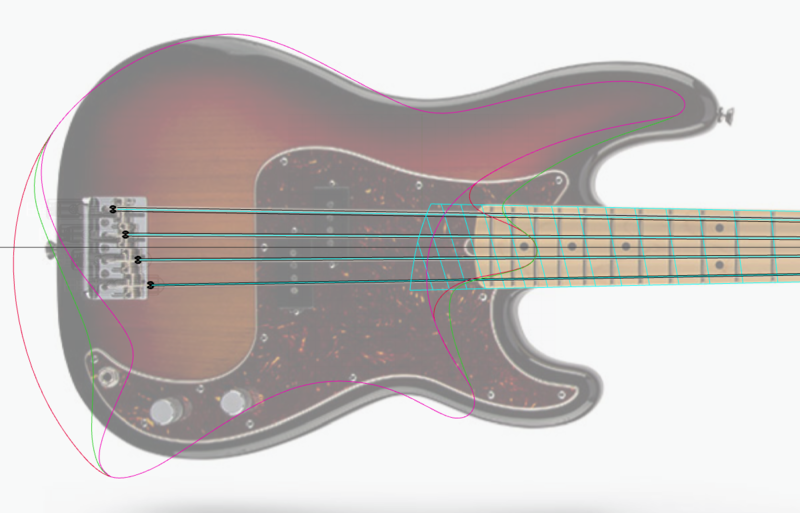 I expect that the Lace bass pickups (which I have never tried) share the attributes of the guitar counterparts of being very neutral and full range. Nordstrand preamps (run 18v) would be a great way to go. Nice and clean, great EQ points and they just redid the layout of them to be smaller, epoxy packed and less expensive. Hello Ola. This looks great. The spacing and scale lengths sound very comfortable to a variety of techniques. My suggestion is this: you might consider incorporating a ramp in between pickups for more ease of faster fingerstyle passages. Perhaps removeable for greater technical flexibility. Thanks! If there is anything I’m personally aiming for, it’s the Wal bass sound of Justin Chancellor. I love the Justin Chancellor tone. I would suggest a filter-based preamp like the ACG EQ-01. Hi Ola ! Fretless with piezo in bridge, of course. Looking at the design long-term, this would be a great platform with which to advance the baritone hybrid design you’ve used in the past. Kubicki’s been doing it on basses for decades, but exclusively in a four-string format. Five and six-string basses with a baritone hybrid option (preferably bottom two strings extended rather than Kubicki’s one) would be excellent. Most practical option is probably something in the vein of a 30-32″ fan (for a 36″ scale on the extended frets), though strings exist that would support a scale of 35″ or so on the bass end. Granted I’m making some assumptions about the possibility of this eventually becoming a production model, but it’d be a great option if that eventually occurred! If anything, this is going to be my dream bass. I wanted a bass that is light due to my back problems. I’ve been holding back on buying a bass because of this. I hope this comes around soon. 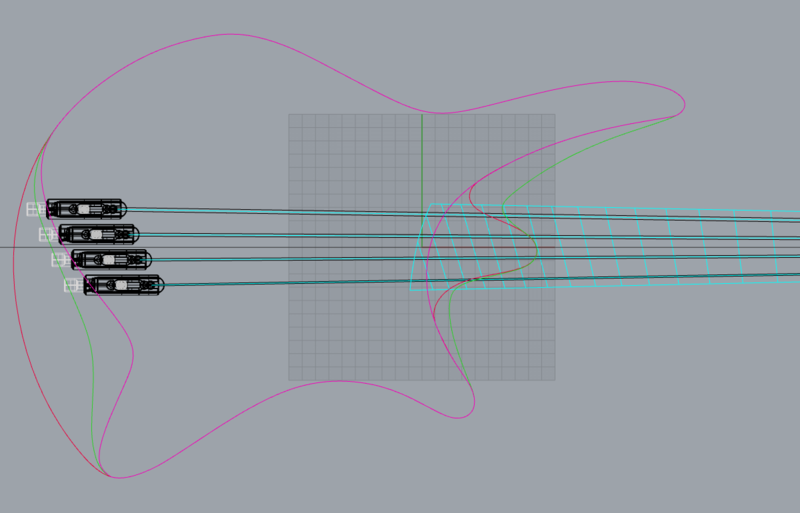 Maybe the only thing I can hope for is the Boden design on a 6 string platform. Wishing you all the best! Hey Ola, we spoke shortly over email about this very subject! I would really like to see an ash body and maple neck. 4-5 string would be amazing!! 35 3/4 on the low b for the 5. Push the bass pickup closer to the treble. Get those defined mids. 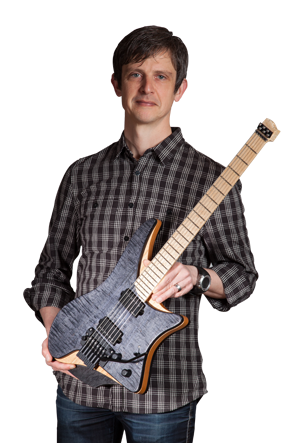 You would have everyone( including myself) knocking down your door for a Strandberg Bass. I wish I could find something similar now. I guess I’ll have to wait until this comes to fruition. Hopefully sometime soon! I still have the email I sent you back in 2012 in which I inquired if you could build me a 6-string bass guitar. I am super glad that you are going forward with the bass idea. Id love to chat some more with you about a bass prototype! Talk soon and all the best!